Sometimes, especially lately, it’s depressing to think about the future of the U.S. But that’s not the real problem. See, on top of all that, we’re $17.5 trillion in debt. The last time America was debt free was 1836. That lasted one year. When Ronald Reagan took office in 1981, the national debt was less than $1 trillion. When he went home to California, the debt was three times that. George H.W. Bush pumped the debt up to $4 trillion. Bill Clinton ran it up to $5.6 trillion. And by the time George W. Bush left office, the debt had nearly doubled to more than $10 trillion. 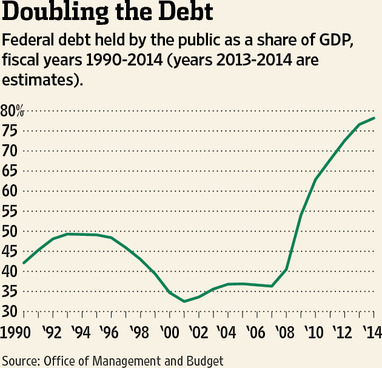 In Mr. Obama’s first four years, the debt has soared more than $7 trillion. How’d we get here? Consider this: When Mr. Obama went to Brussels this week, he took a 900-person entourage, three cargo planes, two 747s, a slew of support planes, a phalanx of Marine One helicopters and nearly 50 vehicles for his motorcade. That was for a 24-hour stay. But it’s not just that. America has been so rich for so long, it just can’t get used to the notion that it’s not wealthy any more. It’s as if America is the wife of a billionaire who finds herself suddenly divorced. No more suites at the Ritz-Carlton, time for the Days Inn. Oh, and get used to mac ‘n’ cheese. Vladimir Putin and his American apologists like to blame NATO’s post-Cold War expansion for his territorial conquests, which ignores that the alliance refused in 2008 to let Georgia and Ukraine even begin the process of joining. Those are the two countries the Russian has since carved up, and the question now is whether Russia’s expansionism will slap Western leaders out of their self-defense slumbers. NATO Secretary-General Anders Fogh Rasmussen sounded the alarm last week in a visit to Washington. “I see Crimea as an element in a greater pattern” of Russian strategy, he told an audience at the Brookings Institution. Moscow’s annexation of Crimea, he said, is “a wake-up call” that “must be followed by increased European investment in defense.” He might have included the U.S. The combined GDP of NATO’s 28 member states tops $30 trillion. Yet with few exceptions, most notably Poland, NATO defense expenditures have declined since the end of the Cold War. 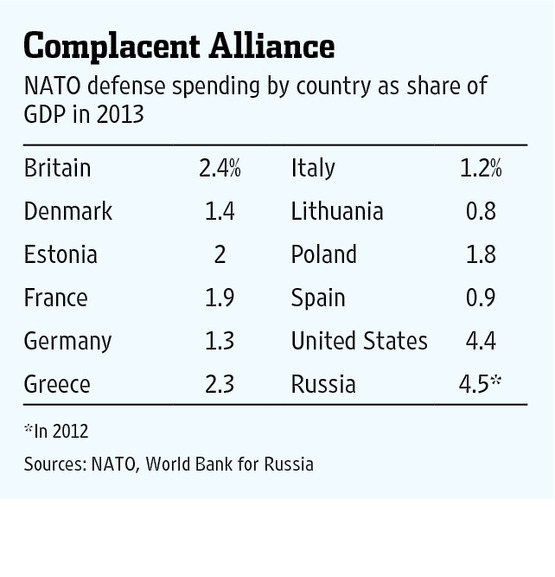 The nearby table shows the relative defense spending in 2013 for some key NATO countries as a share of GDP. Only four members—the U.S., U.K., Greece and Estonia—spent at least 2% of GDP on defense. At 1.9%, France last year fell short of the 2% that is supposed to be the technical requirement for membership. Mr. Rasmussen’s Denmark spent 1.4% of its GDP on defense, Angela Merkel‘s Germany 1.3%, Italy 1.2%, and Spain 0.9%. This is what a country spends if it thinks its main security threat is Belgium. And the trend is down, as a majority of NATO members reduced defense spending in 2013. Among the more drastic defense cutters last year were Canada (7.6%), Slovenia (8.7%), Italy (10.3%), Hungary (11.9%) and Spain (11.9%). The U.S. reduced its overall spending by an estimated 2%. That might not sound like much, but American spending comprised 72% of all NATO defense expenditures in 2013. Under President Obama’s latest budget proposal, U.S. defense spending will fall from 4.6% of GDP in 2011 to 3.5% in fiscal 2015 and 2.9% by 2017 when he is supposed to leave his successor a country stronger than he inherited. On present trend it will be weaker. The Obama theory of “collective security” is that as the U.S. retreats from its historic commitments in Europe and the Middle East, allies will step up to deter aggressors and protect Western interests. NATO budget cuts suggest otherwise. The cuts have created “gaps in meeting core NATO tasks” and resulted in “forces that are not ready, not trained, and not sufficiently equipped,” according to a 2012 study by the U.S. National Defense University. In plain English, this means that if Vladimir Putin sets his sights on NATO’s eastern periphery—by targeting the Baltic states, for example—the alliance may not have the capability to resist even if it has the political will. Two very differing articles regarding the President’s new budget proposal. The first article is from the Wall Street Journal and gives detailed and concise reasons why the President’s proposed budget will not promote faster growth and a healthier economy. Debt in 2014 will hit 78.2% of the economy. President Obama is pitching his new budget proposal as a fiscal peace offering to Republicans, but the details suggest everyone should expect more conflict. The fiscal 2014 plan he released Wednesday is a very slightly modified version of his previous budgets that reduces the deficit by raising taxes and trading defense cuts for more domestic spending. The real news is that his budget ratifies much of the spending increase of the first term and tries to lock it in. He wants the feds to spend $3.78 trillion next year ($11,944 per American), which would still be 22.2% of national output nearly four years into an economic recovery. Before the financial panic in 2008, the government was spending about $1 trillion less, or closer to $2.7 trillion a year and an average of 20% of GDP—and President Bush was no slouch as a spender himself. Mr. Obama wants federal spending to grow to $4.45 trillion by 2018 fueled mostly by the exploding costs of his Affordable Care Act. This spending surge appears smaller than it is only because the government will bank large reductions in military spending as the Iraq and Afghanistan wars wind down. But unlike in the 1990s, this peace dividend will be spent. The budget’s supposed bow to Republicans is Mr. Obama’s proposal for a modest change in annual cost of living adjustments for Social Security. “Chain CPI,” as the change is called, would cut spending by about $130 billion and raises taxes by about $100 billion over the next year. We support the concept, but the White House also slips a mickey into that proposal (see below). The Pentagon has squandered billions of dollars over the past two decades on weapon systems it never produced and on rosy cost estimates that ballooned to sizes that ate up funds for other projects, according to government reports and defense analysts. The miscalculations have come back to haunt the armed forces at a time when tighter budgets are forcing it to curtail basic war-fighting preparations such as training, ship and aircraft repairs, and overseas deployments. Pro-defense conservatives, however, say that despite the procurement mistakes, the country needs a robust military to confront an array of threats — and that costs money. Still, how the Pentagon misspent billions over two decades has relevancy for the future. Money devoted to doomed programs such as the Army’s Future Combat System or poured into the F-35 Joint Strike Fighter could have come in handy today. Analysts say that if the Pentagon had better-managed the research, development and acquisition of satellites, vehicles and planes, the force in 2013 would be more modern and more resilient against automatic spending cuts, or “sequestration,” that began March 1. “Of course they would have more money available to do other things,” Thomas Christie, the Pentagon’s top weapons tester from 2001 to 2005, told The Washington Times. Ben Freeman, national security investigator at the Project on Government Oversight, said poor management has “immensely” affected the armed forces today because misplaced money could have been used to make the force more combat ready. Vice President Biden and his entourage spent a little time in London in early February during his first foreign trip of the second term of the Obama administration. A document released today revealed that the cost of lodging in London alone was close to half a million dollars. The contract was awarded on January 30, 2013 to the Hyatt Regency London for a total of $459,388.65. Due to obvious security concerns, such contracts are not open to the competitive bidding normally required on government contracts. The accompanying document justifying the “sole source” contract notes that the vice president’s group required “approximately 136 hotel rooms for 893 room nights.” Based on these figures and the total contract price, each hotel room at the five star hotel cost the U.S. government about $500 per night. As it turns out, Vice President Joe Biden’s London stay in February was not the most expensive part of his trip. A government document released on February 14, 2013 shows that the contract for the Hotel Intercontinental Paris Le Grand came in at $585,000.50. The documentation for this contract is not as detailed as the London one, so the cost per room is not available. However, just like his London hotel, the Hotel Intercontinental Paris Le Grand is a five star hotel. Again, security concerns prevent these type of contracts from being open to bidding, but if the government was able to do some comparison shopping, the Hotel Intercontinental has a special offer, “Find a lower price elsewhere and your first night is free.” The Vice President stayed in Paris for one night. Slowing federal spending will alleviate fears of higher future taxes, spurring more investment and consumption. Messrs. Cogan and Taylor are professors at Stanford and senior fellows at the Hoover Institution. The macroeconomic model used in their research was published last month in the Journal of Economic Dynamics and Control, with updated results at Hoover’s Economic Policy Working Group website. The reductions in the growth rate of spending are to be achieved primarily through entitlement reforms. The Affordable Care Act would be repealed. Medicaid and food-stamp administration would be turned over to the states. Medicare would be fundamentally reformed. Anti-fraud measures would be applied to federal disability programs. Among the major entitlement programs, only Social Security would remain unchanged; this is a deficiency in the plan. As for discretionary spending, the House budget plan would provide for only slight reductions from the levels that are set by the budget sequester. This week the House of Representatives will vote on its Budget Committee plan, which would bring federal finances into balance by 2023. The plan would do so by gradually slowing the growth in federal spending without raising taxes. The stakes are too high, please get serious about governing before it’s too late. Mr. Van Dyk served in Democratic national administrations and campaigns over several decades. His memoir of public life, “Heroes, Hacks and Fools,” was first published by University of Washington Press in 2007. As a lifelong Democrat, I have a mental picture these days of my president, smiling broadly, at the wheel of a speeding convertible. His passengers are Democratic elected officials and candidates. Ahead of them, concealed by a bend in the road, is a concrete barrier. They didn’t have to take that route. Other Democratic presidents have won bipartisan support for proposals as liberal in their time as some of Mr. Obama’s are now. Why does this administration seem so determined to head toward a potential crash and burn? Even after the embarrassing playout of the Obama-invented Great Sequester Game, after the fiasco of the president’s Fiscal Cliff Game, conventional wisdom among Democrats holds that disunited Republicans will be routed in the 2014 midterm elections, leaving an open field for the president’s agenda in the final two years of his term. Yet modern political history indicates that big midterm Democratic gains are unlikely, and presidential second terms are notably unproductive, most of all in their waning months. 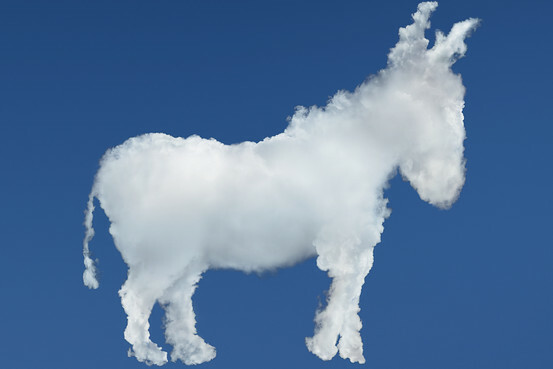 Since 2012 there has been nothing about the Obama presidency to justify the confidence that Democrats now exhibit. Mr. Obama was elected in 2008 on the basis of his persona and his pledge to end political and ideological polarization. His apparent everyone-in-it-together idealism was exactly what the country wanted and needed. On taking office, however, the president adopted a my-way-or-the-highway style of governance. He pursued his stimulus and health-care proposals on a congressional-Democrats-only basis. He rejected proposals of his own bipartisan Simpson-Bowles commission, which would have provided long-term deficit reduction and stabilized rapidly growing entitlement programs. He opted instead to demonize Republicans for their supposed hostility to Social Security, Medicare and Medicaid.